The season may still be considered in its early stage but the Clovis West boys basketball team is off to its customary winning ways. The Golden Eagles are currently 9-0 and coming off two tournament wins, defeating host Rocklin 84-70 for the NorCal Tip-Off title on Dec. 1. 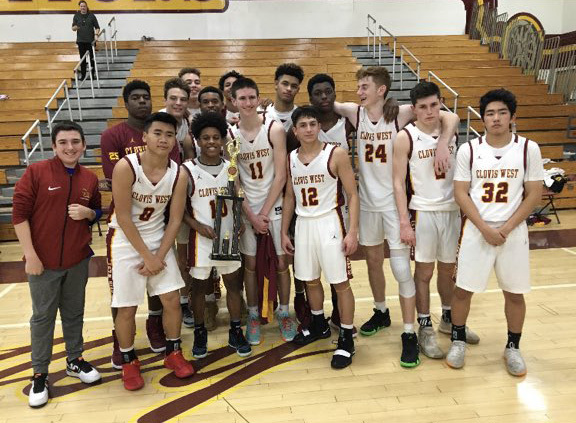 On Dec. 8, they came from behind to beat a very good Chaminade squad 84-79 in the championship game of the Simi Valley Tip-Off. Sophomore guard Cole Anderson earned tournament MVP awards in both tournaments. He sunk seven 3-pointers in the Simi Valley championship game en route to 26 total points. Senior Alex Villi earned all-tournament honors, scoring 21 points in the game. Anderson is a “special talent,” says Walberg, in his third season at Clovis West after coaching at Fresno City College, Pepperdine and the University of Massachusetts and in the NBA for the Denver Nuggets, Philadelphia 76ers and the Sacramento Kings. In his second stint at the helm, Clovis West is a combined 60-9. In his first go-around from 1989-2002, Walberg’s teams at Clovis West went 343-68 with nine league titles, 10 CIF Central Section Championships appearances (including six titles) and three showings in the CIF Southern Regional Championship Game. This season he’s pleased with the depth – a Clovis West staple – playing up to 12 players per game. Anderson, a First Team All-TRAC selection last year as a freshman to go along with four Division I offers, understands it’s a long season, especially when the rugged TRAC begins Jan. 9. However, it’s not all Anderson. There’s certainly help with the 6-foot-4 Villi, 6-foot-4 senior Grayson Carper and 6-foot-5 senior Dez Walls. In addition to Walls, sophomore Marcel Sanders is holding down the inside, providing much needed muscle and rebounds. The team will receive a boost as senior Dante Chachere, an All-TRAC quarterback, will return from a broken wrist suffered during football season. Clovis West will host the 12-team Clovis West Nike Invitational from Dec. 11-15.